Fortune teller gadget shaped like a classic pool eight-ball. The ball is filled with water and contains a multi-face dice, with each side featuring the answer to a question. 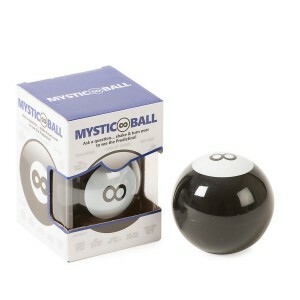 To use it, ask the eight-ball a closed, yes or no type question and then shake it. Turn the ball over to reveal a transparent window with an answer pressed against it. Answers include "Absolutely", "Consult me later", "Chances aren't good" and several others. This is not only a fun novelty toy, but also a pop culture icon featured in the likes of Toy Story, Friends and The Simpsons. The Mystic 8 Ball has 21 different decisions!